We can all heave a sigh of relief that the insane Ted Cruz strategy precipitating the government shutdown and a near economic collapse is finally over. 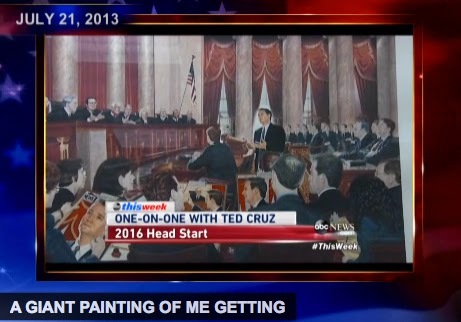 I had forgotten that back in July Stephen Colbert took a swipe at the hilarious portrait hanging in the delusional senator’s office. Standing on the floor of the Senate, engaging in a filibuster, Cruz strikes a Christ-like pose complete with halo and apostles. Here’s an excerpt from The Colbert Report transcript. Check out the full video posted below. Yes, I gotta tell ya, I don’t know what part of this painting comes off as more humble. You know what? No wonder he looks so Christ-like in that painting. I mean, we all remember the story of Jesus promising to multiply loaves and fishes for the poor, then backing out of it on legal grounds. I mean, all that raw fish sitting out in the desert sun? I mean, sashimi and Israel? Come on, that’s just a food poisoning lawsuit waiting to happen.